Why is My Pet Marking My Persian Rug? If you’re reading this blog, chances are, you have a pet that just won’t stop marking your Persian rug. Rest assured- you are not alone. This is actually a fairly common issue among many Persian rug owners. Although we mainly see inappropriate marking occurring among puppies and kittens, adult dogs and cats can also be frequent markers themselves. Let’s find out why. Why is My Pet Marking My Rug? Sometimes, the answer to this question is simply the type of rug that you have. Is your rug a tufted rug? Tufted rugs are rugs with a glued on backing to them. They are quite popular due to being less expensive options than hand-knotted or hand-woven Persian and Oriental rugs. Tufted rugs have a few common issues, though, and one of them is that the glue used to attach the backing to the rug causes many pets to mark the rug. The glue on tufted rugs can come from a variety of sources. It could be a natural or organic type of glue, or it could be a chemical based glue. Both types of glue give off a distinct odor. Although this odor might not be detected by humans so easily, pets can definitely smell it. Dogs are especially sensitive to the odor that a tufted rug’s glue gives off. The scent confuses them and they may urinate on your rug out of confusion. Although puppies are the main offender here, this behavior occurs in dogs of all ages- not just puppies. Cats can also be confused by this odor. If your pet is constantly urinating or marking your tufted rug, it might be time to replace the rug. Although tufted rugs may seem like an inexpensive option when you purchase them, the amount of cleaning you will end up needing is simply not worth it in the end. But My Rug Isn’t Tufted! Your pet may still mark your rug, even if it is not tufted. There are a few reasons for this. If your pet has marked your rug for quite some time and it has not stopped this behavior, it might be because your pet believes that marking your rug is allowed. Your pet cannot tell the difference between a fine rug and “its spot.” They are one and the same to your pet. It is important to stop your pet from marking your rug as soon as you see signs of this behavior. All pets are different, so there is no universal approach to stopping the behavior. We suggest taking the approach that you normally do when you are teaching your pet right from wrong. If your pet is normally well trained and has suddenly started marking your rug for no reason at all, there could be a few different causes. Is your pet marking many surfaces and not just your rug? Your pet could have digestive or urinary tract issues. This is especially common in older dogs and cats. Call your vet and explain what is going on. Let them know that your pet does not normally do this, and this behavior is recent. They will be able to provide you with the proper knowledge on how to approach this situation. If your pet is only marking your Persian rug, you must approach the situation differently. This is likely not an issue with your pet’s health but with your pet’s behavior. There is a very good chance that your pet was marking the rug without you noticing, and they have been conditioned to believe that is okay. Keep a close eye on your pet and stop them from marking the rug as soon as you see them trying to do so. Alternatively, you can stop your pet from being on your rug at all. Another reason that your pet might only be marking your rug is that there is some sort of odor attached to it that your pet does not agree with- such as the smell of another animal or, as mentioned above, the smell of your pet’s own urine. We strongly suggest having your rug cleaned and opting for an enzyme wash. An enzyme wash will break down the odors in your rug, including the odors that make your pet feel that it is okay to mark your rug. You can read more about this process on our odor removal page, or you can call us for more information. There is no obligation to purchase a service if you call us. We understand that you might want to shop around, and sometimes you just want to know how rugs are cleaned in the first place. For information on how to minimize odors and prevent stains after an accident, check out our blog post, Baking Soda and Persian Rugs: Taking Steps to Minimize Pet Damage to Your Rug. If you’re reading this, chances are, you have a pet at home! Does your furry friend just love to mark everything, including your Persian rug? Dogs are man’s best friend, but rugs? Not so much. Lament no more, because there are steps that you can take at home to minimize the damage done to your rug. While these steps cannot replace having your rug washed and sanitized, you can at least rest easy knowing that there is something you can do before you arrange for a rug wash. Many Persian rugs are made of natural fibers (ex. wool, silk, and cotton). These natural fibers are especially absorbent, so it can be difficult to deodorize and clean the spot where an accident occurred. You will always want to confront pet accidents as soon as possible to minimize damage. We understand that it is not always realistic to bring your rug in for cleaning or even to have it picked up from your home. There is a common household item you can use to minimize damage until you can have your rug cleaned, though. Yes, you read that right! Baking soda- it seems like we use it for just about everything except for actually baking. You can using baking soda to deodorize your rug after a pet accident. You can use baking soda to prevent the damage done to your rugs after a pet accident. Before you proceed any further, you will want to make sure that the accident on your rug has dried completely. Adding baking soda to a wet spot could result in a damaged rug. If you want to be extra sure, blot the spot where the accident occurred with paper towels. Next, place a generous amount of baking soda on the site of the accident. The spot where the accident occurred should be completely covered in a layer of baking soda. You don’t need a thick pile of baking soda placed on top of the spot, just enough to cover. Leave the baking soda on for a few hours, then, vacuum or sweep your rug. If you are using a vacuum, make sure it is a lightweight style suitable for the gentle fibers of fine rugs. You don’t want to damage your rug, and since you are only removing dry baking soda, there doesn’t need to be much force put on your rug in the first place. If you’ve made it this far, congratulations! You’ve done your part as a responsible rug owner. The baking soda will help to minimize any odors and stains. As mentioned earlier, this method will not replace a rug wash, but it will help to keep your rug safe before you can arrange for your rug to be cleaned. You will want to arrange for a rug wash as soon as possible, not just for deodorizing but to sanitize your rug, too. Behnam Rugs does not recommend using any chemical cleansers to clean pet accidents from your rugs. 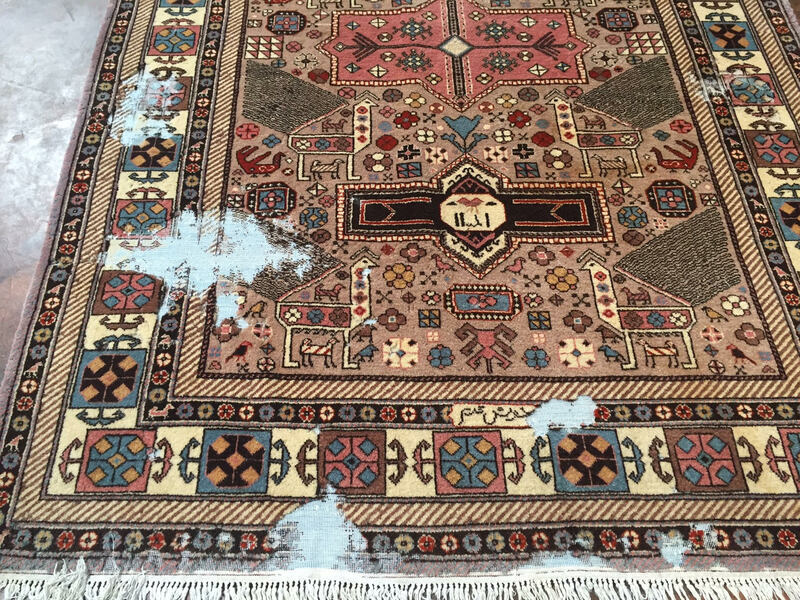 These chemicals often respond poorly to the dyes and natural fibers of Persian rugs, and we have seen far too many rugs damaged by these cleansers. To learn more about rug care and rugs in general, feel free to call us at 972-733-0400 or visit our showroom. We are open Monday through Friday, 9AM to 5:30PM. Moths will eat anything, and your rug is no exception. Moths are one of the worst enemies of any fine rug, especially older and antique rugs. You should be especially aware of the cloth moth, as this is the type of moth that would love to feast on your priceless heirloom. 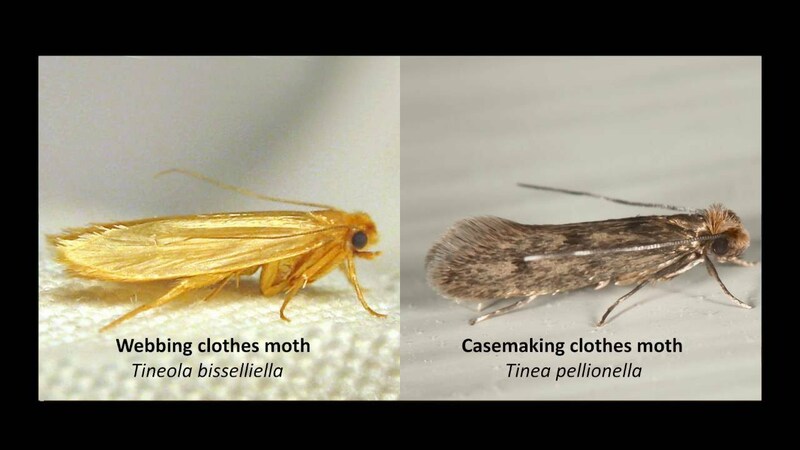 Two different types of cloth moth to watch out for in your Persian Rug: the casemaking moth and the webbing moth. Why Are Moths in My Home? How Did Moths Make Their Way into My Home? You might think that your house is moth free and your rugs are safe and sound, but moths are always looking for ways to enter your home. Moths can enter your home easily and be undetected as they do so. Mail, pets, open doors, and moving items in and out of warehouses and storage are just some of the ways that moths can enter your home. To moths, your home is a paradise. It provides shelter from predators, an excellent source of food, and many nesting spots. Once moths enter your home, they can lay anywhere from 30 to 200 eggs per month. Those eggs will eventually grow up to become adult moths, and they will also lay 30 to 200 more eggs every month. A moth problem can easily become a moth disaster for your rugs and the rest of your home. As we enter moth season, it is important to take some time to check your home for moths. Frequent moth checks are the best way to prevent a large moth damage problem from taking over your home, and checking for moths is simple. One of the easiest methods to indicate whether or not your home has moths is by using a moth trap. Make sure the trap you are using is for cloth moths and not another type of moth. 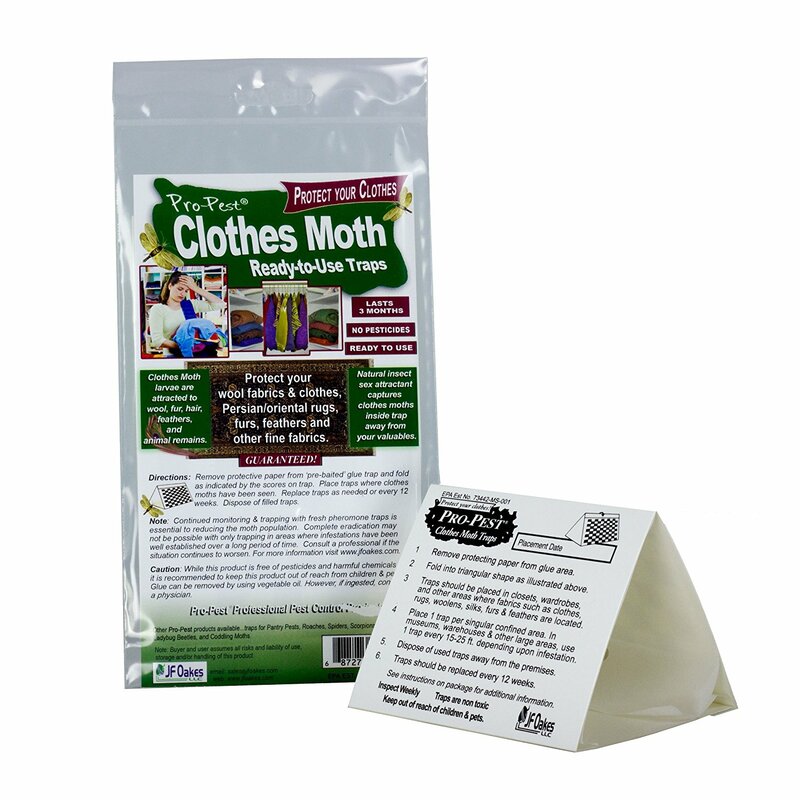 A cloth moth pheromone trap will help you indicate whether or not you have moths in your home. These traps work by emitting a pheromone which attracts male moths into the sticky bottom layer. The male moths are trapped and prevented from reproducing. Do note that moth traps are only an effective way to indicate that moths are in your home. They are not an effective way of getting rid of moths, should you find any. If your home is moth free, it is important to make sure that your home stays that way. The best way to prevent moth infestations is to constantly be monitoring. Moths can enter your home with no warning. A harmless box from a warehouse could actually be carrying eggs. Moths reproduce at a rapid rate, and they eat and damage your belongings at a rapid rate, too! To prevent moths from doing thousands of damage to your rugs, you may consider keeping a moth trap in your home throughout the year. A fine handmade rug can take a lot of damage from moths in just a short amount of time. Many fine rugs are made of natural fibers, such as wool, which over time lose their natural oily properties and become drier, making them easier for moths to eat than a new rug. Although you can do nothing about the age of your rug, you can prevent your antique rug from becoming a moth’s next meal by regularly cleaning it. A clean rug will not be nearly as appetizing. You should also regularly vacuum your rugs- and not just the visible areas. Moth eggs love to hide in dark, damp, and quiet spaces with little to no air circulation. This means that areas under your china cabinet, your sofa, and even the underside of your rug are all the perfect spots for eggs to grow. Be proactive and clean these areas regularly. You should also rotate your rug at least once a year. On top of preventing moth growth, rotating your rug will also help in distributing the amount of traffic your rug receives on different areas. If you are taking an extended vacation, make sure that your rugs are stored properly. Make sure your home is dry and has proper air movement during your time away. When you return, make sure to vacuum and clean your home thoroughly. Your time away is the perfect time for moths to play. Remember, proper rug protection is one of your responsibilities as a rug owner. When you put in the extra time to keep your rug in good shape now, you are actually saving yourself from weeks to months (sometimes even years!) of headache in the future. If you have moths in your home, you should act immediately. Rugs can easily do thousands of dollars of damage to your rug. A $50,000 rug can easily receive $30,000 worth of damage. First, vacuum your house thoroughly. You will want to vacuum both the front and back of all of your rugs. Make sure you vacuum areas underneath furniture and behind your curtains as well. Take your rugs and place them in an area where they can receive direct sunlight. The ultraviolet rays will work quickly to kill any eggs that are still hiding in your rug. Don’t forget- the backside of your rug needs to be placed in direct sunlight, too. If you have access to a leaf blower, use one to blast air in areas where moths nest. This includes under your furniture, in the corners of your closets, behind your curtains, and any other dark and quiet areas. Your next step will be to sanitize and wash your rug– bring your rug in for a professional cleaning. At Behnam Rugs, we can determine the amount of damage done to your rug and what steps should be taken next. Small areas can often be rewoven at a cost that would be far lower than replacement. Large areas can be shaved and sheared to minimize how obvious the damage to your rug is. 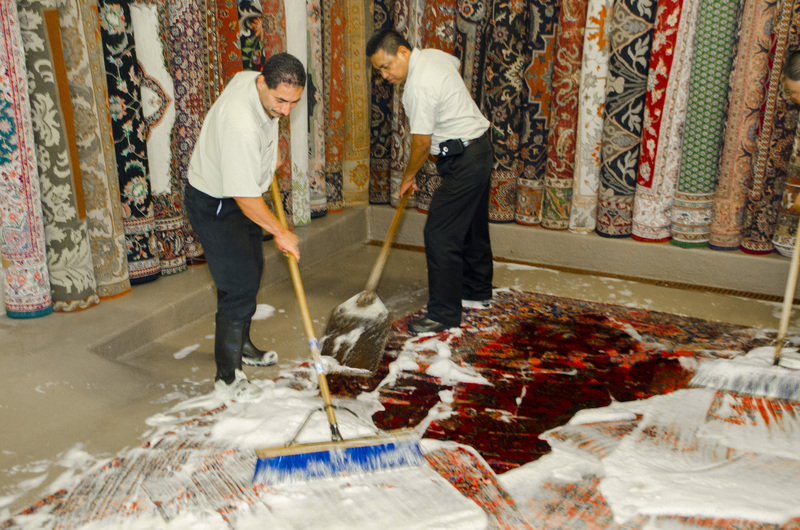 The professionals at Behnam Rugs will sanitize your rug the natural way. Kill moths without damaging your rug. Even if the foundation of your rug has been damaged by moths, there are still options. Behnam Rugs can permanently dye your rug to minimize how obvious any damage is. The moth damaged areas will be hidden by the dye. In severe situations, your rug may require a large amount of reweaving. Reweaving is generally a more expensive repair option, and the cost can be very high when reweaving is required on a larger area. In these situations, your rug may need to be sent to a country such as Turkey or Iran for the reweaving job to be completed. This process can be time consuming and costly. Remember to constantly check your home for moths in order to prevent this sort of hassle. Can I Chemically Treat My Rug? Behnam Rugs does not recommend chemically treating your rug, be it for moth proofing or moth extermination. Harsh chemicals can damage your rug, and they can also hurt you. Your rug lives with you, whether it is on your floor, your wall, or your stairs. You and your family constantly interact with your rugs. Behnam Rugs prefers natural prevention methods and restoration methods. If you have any further questions on moths and how they can affect your rugs, please feel free to call Behnam Rugs at 972-733-0400 or visit us during our store hours. Behnam Rugs has over 39 years of experience with rugs and rug repairs, and our rug experts would love to help you. The cost of washing your Persian or Oriental rug varies based on a number of factors. Not all rugs are made the same way, so each rug will have its own unique wash. In order for our professionals to determine the correct wash for each of your rugs, we will need some information and a short history of your rug. What Sort of Information Should I Know About My Rug? First and foremost, you should know what type of rug you have. Is your rug machine made, handmade, tufted, hooked? Once you know the type of rug you have, the rest of the details will be much easier to find out. Next, know the country of origin of your rug. Persian rugs are not always Persian (Iranian) in origin. You can have an Indian Persian rug, an Afghani Persian rug, an Egyptian Persian rug, and so on. You may have records indicating the origin of your rug. Otherwise, feel free to come in and ask Behnam Rugs about the origin of your rug. You should know the material of your rug. Rugs are made out of a variety of materials. Generally, if a rug is made with natural fibers, the materials used will be wool, cotton, silk, and jute. If your rug is made of synthetic materials, some of the materials used might be nylon or viscose. Finally, we will need the age of your rug, the last time it was washed, and if you have any pets. We do not need the exact age of your rug, just an estimate. Again, if you are unsure, please ask us for assistance. We would love to help you learn more about your rug. These details will help us determine what sort of washing your rug needs. We understand that you might not know every little detail about your rug, especially for older rugs that may have had a couple of owners before you. If you are unsure about certain details, ask us! The rug experts at Behnam Rugs will be able to determine the precise details of your rug. Interested in a Rug Wash? If you have decided to wash your rug, contact us today for a free price quote. We are open Monday through Saturday, 9:00AM to 5:30PM. If you are well-informed on your rug, feel free to call us for a price quote. When you have a delicate, valuable piece of clothing, you usually get it dry cleaned. That same concept applies to rugs as well, right? Wrong! Dry cleaning your rug is absolutely not a good idea. Read on to discover why that is. Persian rugs are delicate and made from fine, natural fibers like silk, cotton, and wool. “But so is my wool suit! Why can’t I just dry clean my rug, too?” you may be thinking. Although dry cleaning your clothing is all well and good, your rugs should never be cleaned with dry cleaning fluid. Because of the way rugs are made, the chemical compounds will “stick” to your rug, so to speak, and your rug will likely never feel as soft or be as durable as it was before dry cleaning. So, how do you actually wash a Persian rug? The good, old-fashioned way, of course! You wash a Persian rug with water and natural solutions. Persian rugs have been washed this way for thousands of years- for good reason, too. A Persian rug that receives a proper, natural washing can stay clean, soft, and stable for years. If you’d like to learn more information about traditional Persian rug washing, or if you have any questions regarding Persian rugs in general, please call us at 972-733-0400. We would love to answer any questions that you may have.